Bioartography is a joint venture by scientists and artists across the University of Michigan campus. This program identifies the artistic nature of scientific studies and illuminates them through a microscopic lens. A panel of artists and scientists contribute their perspectives, and the profits of these sales fund scientific research. Some of these creations have even been adapted and pieced together as quilts by the Healing Quilts in Medicine program. By far, an art fair favorite. Inspired by Bioartography, I created this collage. 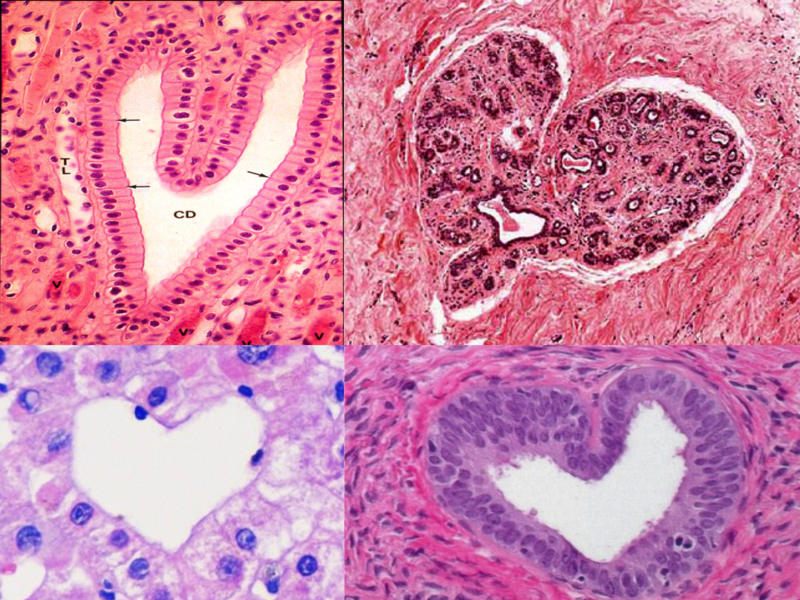 A collection of tissue slides in the shape of a heart, although ironically not of the heart. Sometimes the tendency to wear your heart on your sleeve, to openly express your emotions, can be suffocated by the medical profession. But wearing your heart on your back is becoming increasingly appreciated. The Walking Gallery is “the Gallery that walks. The Patients that wear our stories on our back” (Holliday). Image courtesy of Ted Eytan under a Creative Commons license: BY-SA. 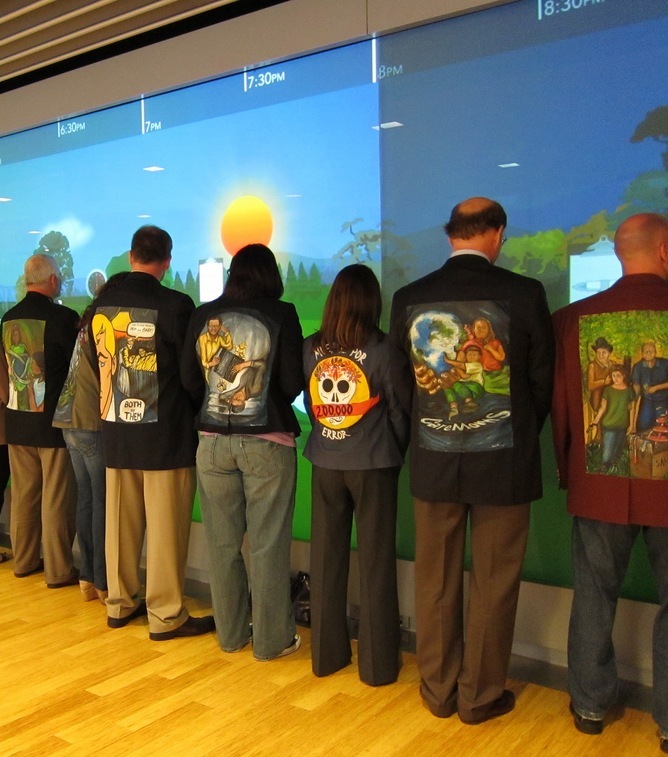 It’s this revolutionary idea that art can provide a window into the patient experience, one that can be displayed by the clothes on a person’s back. This offers mobility to art, a method of transportation that escapes the confinements of wall hangings and pervades into inevitable lines of vision. This increased accessibility allows “patients,” as embodied by this artwork, to enter into places and discussions that they have never before been a part of. Now, patient experiences can be visible and actively remembered in the decision spaces that often influence but do not include patients. The work of Regina Holliday, the artist who brought this exhibit of sorts to life, is inspirational. She not only has a way with art, but also a way with language: her overwhelmingly powerful talk at Stanford incredibly moved me, and she has piqued my interest in exploring the place of art in medicine. Holliday is one of the first artists that I’ve come across in the field of patient advocacy, and her creations have gathered incredible force for this movement. What I love about the Walking Gallery is that it takes a step forward to putting a story to the patient experience. These jackets and the images that they bear evoke emotions buried within medicine. And The Walking Gallery is not limited to patients: physicians, policy makers, and others associated with health care all have stories to share. Despite the distinct roles in medicine, art overcomes these boundaries with brushstrokes and splashes of color. We can wear our experiences, the good and the bad and the in-between, the joys and sorrows, the triumphs and trials. Boldly. Mid-July in Ann Arbor means heat, humidity and sun, with a splash of sporadic thunderstorms. But it also means Art Fair, 4 days of celebrating and supporting the work of artists from around the nation. In honor of the Ann Arbor Art Fair, I will be posting daily this week about art as an illness narrative. I love to think about how the practice of medicine is both a science and an art, and I stumbled upon this interesting article called Medicine: Science or Art? which teases out this idea. “Medicine is both an art and a science. Both are interdependent and inseparable, just like two sides of a coin. The importance of the art of medicine is because we have to deal with a human being, his or her body, mind and soul. To be a good medical practitioner, one has to become a good artist with sufficient scientific knowledge. Technology covered with the layer of art alone can bring relief to the sick” (S.C. Panda 2006).